A rat trap will only kill one rat at a time and quite often rats are way too wary of bait stations, so air rifle shooting can be a successful solution (and a bit of fun). And it goes without saying that the best time to catch a rat unaware, is at night. By using night vision kit, you can become the ultimate rodent predator. 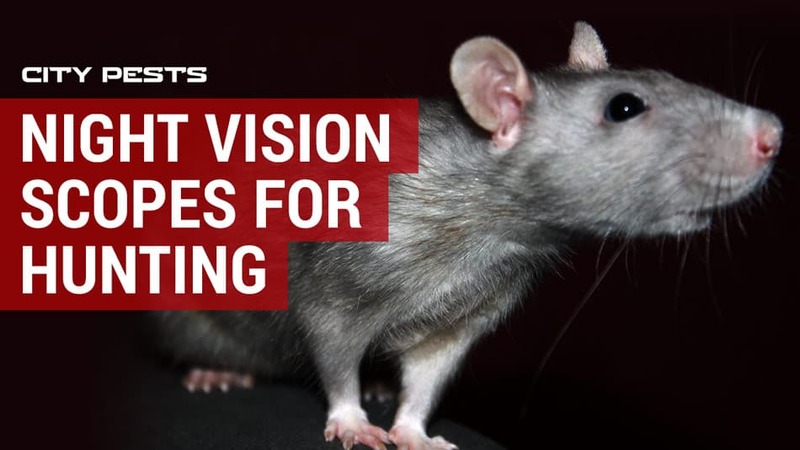 Night vision kits are so effective as they provide you with a thermal vision scope in which to penetrate darkness and spot rats using heat sensors for increased stealth. The best night vision scopes even work when the rats are playing hide and seek behind light cover such as grass, bush or even pallets. And, with some even able to work in light fog and rain, there is no escape for these sneaky vermin. 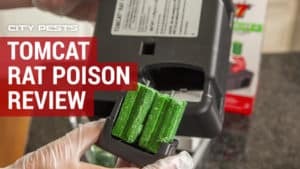 Below I will talk you through the benefits of using night vision kits and my recommendations for the best products currently available on the market. I have never been a fan of spotlighting or lamping and it is, in fact, illegal in a number of U.S. states. I have never been an opportunist either but prefer a planned ambushed attack, which is why shooting rats using night vision and from the cover of complete darkness works better. This way, you can spot the rats out on the prowl with your night vision scope, without them spotting you. Having the right kit makes all the difference. When first introduced, night vision scopes were incredibly expensive and realistically out of reach for most ratters. Today, however, there are plenty of affordable options for all on the market and I have reviewed my favourites below. I would also recommend doing your research on the best air rifles to use for rats, as this will determine the pellets you fire. Finally, I would recommend investing in a comfortable chair as it is likely that you will sitting around for quite some time waiting. It is important that you choose the right spot to set up your night vision equipment. Primarily this should be safe, secure and well away from any hazards. I prefer to look for somewhere with cover or ideally inside to shelter from the weather, whilst ensuring that my rifle is positioned close enough to rat hotspots such as pallets and food sources. 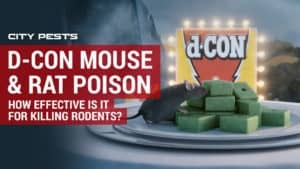 I tend to place sticky food bait such as cat food, on well-known rat runs as it encourages the rats to linger for longer and allows you extra time to prepare for the most precise (and humane) shot. 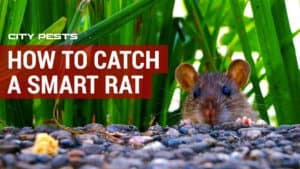 Rats tend to be more active during the warmer months as this is breeding time, so be prepared to catch a lot more rats in summer. Always make sure that you pick up any dead rats. 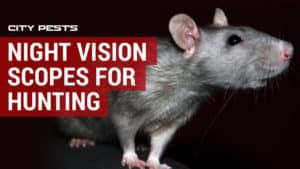 Leaving them behind will only attract other animals, and rats even have cannibalistic tendencies so you could end up just attracting more, rather than depleting them. Below I have reviewed my top selection of night vision scopes that enable you to just attach the kit to your rifle and off you go. I am a bit fan of this piece of kit, as unlike many other scopes, the silky-smooth zoom lets me get right in to the action by magnifying the target. And, with its ballistic calculator, I can take each shot with confidence knowing that it will instantaneously change the distance and improve my shot placement by adjusting my point of impact. On top of that, it also records in HD each shot fired, so I can monitor my technique each time I pull the trigger and there is also a gyroscope, e-barometer and e-compass to boot as well. I believe that this is the ideal night vision scope because it detects heat energy, instead of light which allows you to see clearly, whilst in complete darkness. 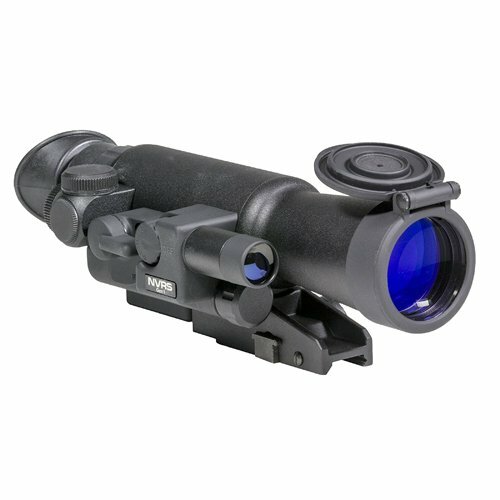 A much cheaper alternative, but still another scope that can be used both day and night, is the Firefield FF16001. This piece of kit comes with 3 x magnification and is the most powerful in its price range whilst its rock solid, yet lightweight, titanium design allows it to be lugged almost anywhere and in all weather conditions. 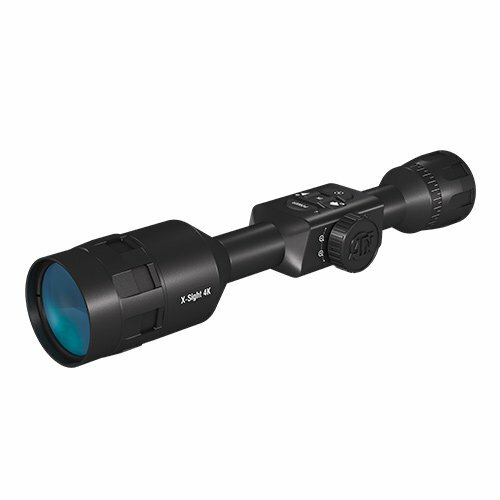 This scope has a built-in IR illuminator, which not only improves the details of the image its projecting but also significantly enhances the viewing range in darkness. It also has flip-up lens covers which open to reveal enhanced, multi-coated optics and an illuminated red duplex reticle with incremental brightness adjustment, enabling you to quickly adapt to your surroundings. 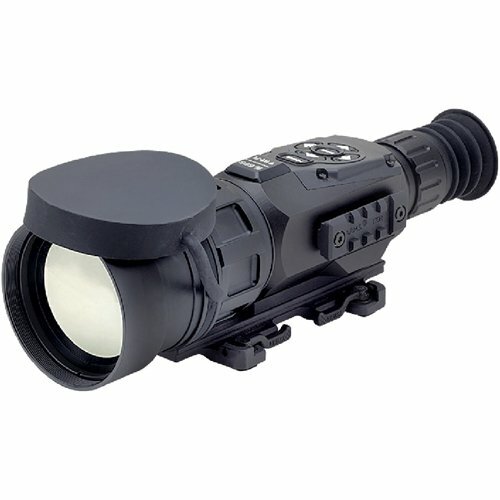 An evolution of previous additions, this innovation night vision scope is a handy piece of equipment at a great pricing point. Packed with features such as a ballistic calculator and HD recording functionality, it effortlessly merges the latest technology with the look of a more traditional scope. Its low light 4K sensor offers outstanding image performance with no pixilation on the zoom. Making sure you hit the target every time, its ballistic calculator measures range, wind, multiple-weapon profiles, angle to target, temperature, humidity and much more besides. And, with 18hours worth of battery time, you can fire all night long as your scope will keep going for as long as you do. Can rats see red light? Rats mainly see in black and white, although they do pick up the presence of red wavelengths. When it is filtered, however, it is much less likely to spook a rat than a bright white light. Do rats see better at night? Rats should probably eat more carrots, as they are unable to see in the dark but are able to move seamlessly using their whiskers. By twitching them back and forth, they can tell the proximity of objects in their vicinity and work out routes to their desired destination. Thanks to their astute senses they can adapt quickly to new environments. In fact, studies have shown that they are able to navigate their way around new and unfamiliar places without any light at all. Is it normal to see rats during the day? Rats are nocturnal so tend to be most active at night. If you do see rats during the day it generally means that they are hungry and searching for food. 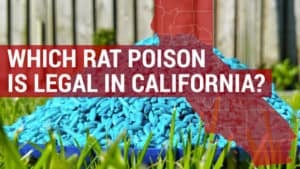 Other reasons why rats may start venturing out in daylight hours could be because they are being disturbed or due to a large infestation. 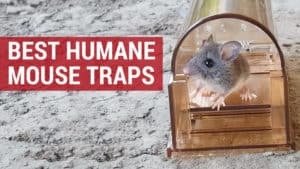 There are many things you can do to control and get rid of rats in addition to air rifle shooting, and these include using bait boxes filled with poison, laying rat traps or by using more humane methods to discourage them. Rats are drawn to our backyards and gardens thanks to the lure of birdseed, fruit and vegetables and plenty of places to hide. 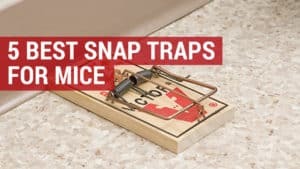 There are many ways in which you can discourage rats from entering your garden using natural methods, but if these do not work, then you may have to resort to shooting them. Unless you are used to handling an air rifle, I would suggest getting an expert in to remove these unwanted visitors. If, however, you do want to tackle the problem yourself discreetly, then I would suggest investing in a modern air rifle that is quiet so as not to offend or alert your neighbours. You should always ensure that you have a secure backdrop for which to shoot against as you will be breaking the law if a pellet was to stray outside of your boundary. 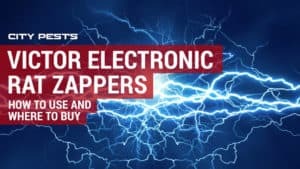 Whichever night scope you choose to use, you’ll find that once you’ve made the investment a whole new world of ratting is revealed, especially as these pesky pests tend to be most active at night. And, when the shorter days start to restrict your daylight shooting, you can smugly revel in the fact that your night vision scope gives you an all-round solution. This is one pest control investment, that you won’t regret purchasing.